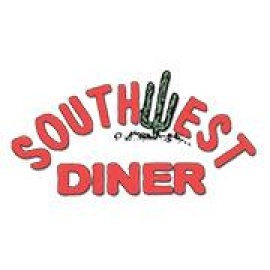 For almost two decades, Southwest Diner has been serving Boulder City,Nevada. Specializing in old fashoned- what grandma used to make-home cooking. Including homemade meatloaf and potroast dinners with all the fixins'. Breakfasts are fresh of the griddle- with huge 3 egg omelets, good ol' bacon and eggs and the famous "those potoatoes" are a must have! Cant forget the lunch time favorites, like "The California" a grilled turkey sandwich on sourdough, and "The Avocado BLT", with a side of the best homemade cucumber salad you will ever taste.All of the recipies originate from Grandma Citrowski. For years she put all of her love and care into cooking and raising 9 children on the farm in Minnesota, now her legend lives on through her Grand-daughter Cindy Ford, the owner at Southwest Diner. If you want to feel at home, please stop by, our antique decor changes with the seasons, and our staff treats you like you family.We cant wait to see you, and dont forget- "Homemade is our Speciality".